I had a half-day off of work this afternoon, so I ran down to West Marine to pick up some West System Slow hardener. The fast I bought was great in the fall and spring, but it's a bit too aggressive for the 70 degree days we're seeing now, especially considering I am not always super-efficient. The extra pot-time is nice. Exercising great self control at West Marine I made it out to Ravat in short time and un-tarped her. The wind wasn't too bad, and I'm starting to get quite good at tightly rolling the big blue beast in between gusts. Once it turns into a giant sausage tube the wind isn't so brutal. With a little set up time I pieced back together the balsa sections and did some trials to make sure everything was ready. 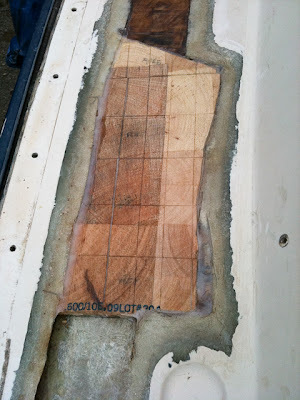 When I was confident of the jigsaw pattern I went below to mix the epoxy. I mixed up 105 resin with 206 slow hardener in a dixie cup and added a few teaspoons of 406 Colloidal Silica to thicken the goop to about a mayonnaise or ketchup consistency. After cleaning the laminate with acetone I made a sort of fillet around the entire area to soak up imperfections in the balsa fit, then laid down a thin spread over the entire bottom of the deck laminate. Ideally, this would be done with a notched spreader, but I didn't have one available. This layer was just thick enough to float above the minor imperfections in the laminate surface, but no more. I then pressed the deck core into the laminate and aligned everything. The final step was not easy. I pressed slowly and with great force (maximum thumb power!) to press the core into the bottom and ensure it was bonding to the laminate, not just floating in the epoxy. I definitely think a notched spreader would have taken much of the effort out of this step. I worked my way from the center outward, and from fore to aft. This stage was where I really appreciated the slow hardener as it took a good 15 minutes to work the excess epoxy out. When epoxy finally stopped oozing from the joints I spread a thin layer across the top of the balsa to provide a minimal seal until I would be able to lay down glass atop the repair. My well worn tarp definitely lets in some rain, and I didn't want to let the new balsa go into sponge mode. It took longer and was messier than I'd anticipated, but I'm very enthusiastic about the finished job. It looks very clean, and the thickened epoxy did a great job (with the help of a spreader) filling the gaps. I'm anxious to get back out there and finish this up now that I've stuck my toe in the water and tasted success.